City Living for Plant Life... and Why It's Not So Easy! When planning a relaxing day out, where would you be more likely to spend your time: a parking lot, or a park? A park, obviously; everyone can agree that a touch of nature in our life makes it livelier. Perhaps seeing more nature in your day-to-day activities would add some much-needed refreshment, especially in cities, where trees can be few and far between. We all know the benefits of plant life to our environment and how scarce it can be in urban settings. The solution, on the surface, is an easy one: just plant more trees! Unfortunately, turning a concrete forest into an urban forest not quite that simple. Let’s consider costs and benefits of expanding urban forests, plus the jungle of roadblocks that stand between a tree and an established, happy city life. Total cost per tree planted is probably more expensive than you think: in Richmond, Virginia, a new roadside tree can be planted for the low cost of $340 according to the City’s Adopt-A-Tree program as of 2018. “Low cost” is right; in New York City, that number balloons to a whopping price tag of $2,000 per tree. If the city fails to maintain these young trees into adulthood, replacement costs only continue to multiply. We want to help these young trees thrive for reasons beyond the high cost of replacing them. We care about more than the dollar value; plant life creates relief from the artificial look of city landscapes. Did you know that urban forests’ benefits extend beyond making city streets easier on the eyes? 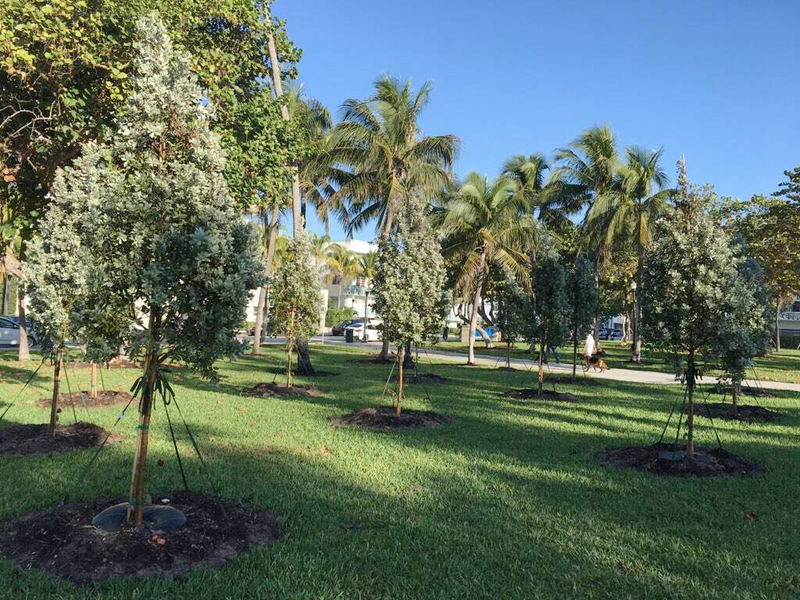 Trees also assist in managing stormwater runoff by removing toxins through natural biofiltration. City trees improve our air quality and environment overall by storing excess carbon and making better use of otherwise wasted rainwater. Even property values are influenced, seeing noticeable increases when surrounded by trees. These observations check out; the U.S. Forest Service wholeheartedly supports urban forests, saying that, “Every dollar spent on planting and caring for a community tree yields benefits that are two to five times that investment—benefits that include cleaner air, lower energy costs, improved water quality and storm water control, increased property values, and health of citizens.” These are advantages that come from having established trees; newly planted trees cannot do all of the above. If we want urban forestry to continue performing these important functions cost-effectively, the goal is clear: don’t just “plant more trees.” Instead, invest in the ones we have already planted, ensuring that they survive to the point where they create benefits. Trees that wither away before reaching maturity, only to be replaced with another tree doomed for neglect, provide little benefit to the cityscape in comparison to trees that have become established in the environment. The resources consumed in nurseries, transportation, planting, and maintaining at the beginning of the tree’s life go to waste if the tree does not survive. Why do city trees need to be replaced so often? The answer is almost always over- or under-watering. Other factors can come into play, such as planting methods, disease, and soil quality, but the most widespread cause of death for young urban trees is improper watering. To make the most of our investments in trees, we need to make the most of natural and manual watering methods. Trees intended for natural biofiltration of stormwater runoff are oftentimes planted in storm drains, where the soil moisture can fluctuate wildly depending on weather conditions. When faced with inefficient runoff management, these trees can either become swamped with too much water or parched when rain is scarce. Using new technology to stabilize soil moisture would be an influential first step in extending the lives of urban trees. As for street-side trees planted directly in the ground, underwatering tends to be an issue; watering bags, which drain in mere hours and dump water directly on the root ball while shielding natural rainfall and discouraging outward root growth, are often left unfilled due to the high costs of manual watering. These costs include fuel, labor, and even police escorts to manage the flow of traffic in larger cities where the watering truck must make stops in busy areas. It’s no wonder trees are forgotten, given the hassle required to water them. Despite these efforts, water from traditional manual methods is still equally susceptible to runoff and evaporation as natural rainfall. What can we do about this? New technology exists to mitigate these problems, but sometimes bringing about change is difficult. The end goal is clear – to fill our cities with happy, healthy, long-lasting plant life – but the path there is tricky for us… and the trees, of course. City life for plant life is no walk in the park. If we can turn our focus from planting more trees to planting healthy trees, maybe city life can be just that: a walk in the park. Blog Permalink: City Living for Plant Life... and Why It's Not So Easy!